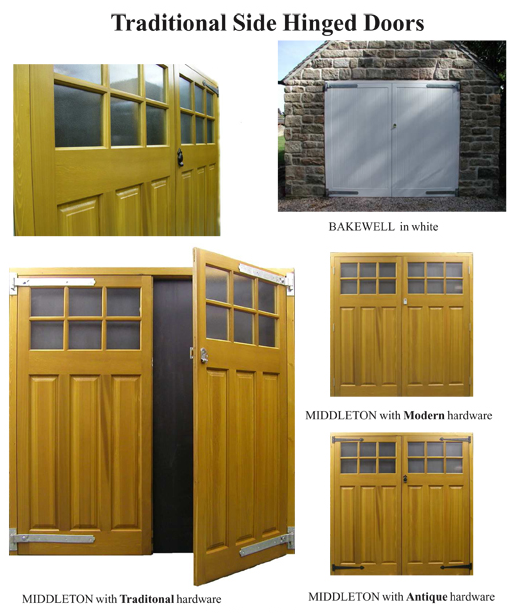 When we talk about timber garage doors the side hinged type of door is often the one conjured up in the mind. It is the most traditional of garage door types and over the last few years we have seen a big resurgence of interest in this door type as it offer easy access to a garage on foot and a lot of people do not use their garages for vehicles so it makes sense. The natural insulation properties and general warm feeling of timber as a material also make it ideal for side hinged doors. We offer made to order, side hinged doors in traditional joinery methods and have a range of standard sizes built into steel box section chassis frames offering the option of a steel sub frame and a lot of benefits in pricing as less timber is required to build this door as the basic panel strength comes from the steel chassis. These are made by Garador Doors. The timber used for most garage doors is cedarwood as it is light in weight and colour and very stable in our UK climate. It has an almost knot free content and will stain up to any shade required. We also can offer timber side hinged doors in Idigbo, Larch and Iroko. Oak is a bad option for a large door hanging from the side as oak is heavy and generally unstable, Idigbo is the better alternative being lighter and better still a lower price! All side hinged timber doors are constructed using traditional methods with mortice and tenon jointing. 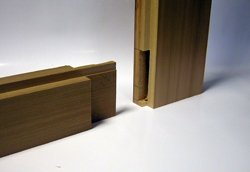 The different door designs may have either screws or staples depending on the designs and thickness of timber sections used. All the side hinged timber doors we supply are manufactured as made to order sizes both in width and height. The maximum height is usually about 8 feet (2438mm) and the maximum width is 10 feet (3048mm). A choice of various furniture sets is offered in modern or traditional styles with options for you to supply your own furniture if preferred.